Sean: "Holy $#it, that was close! Who tossed the Orc this way with the catapult! David: "The Orc stunt guys said it was PJ!" Sean: "That's it, that Hobbit gets tossed next!" Faramir: The barber was killed in the last attack and all the shampoo was destroyed! Boromir: She sells seashells by the sheasore. She sells sheasells by the-- Se shells-- SIT!!! Faramir: She sells seashells by the seashore. No wonder Dad likes you best. He can't do it either. 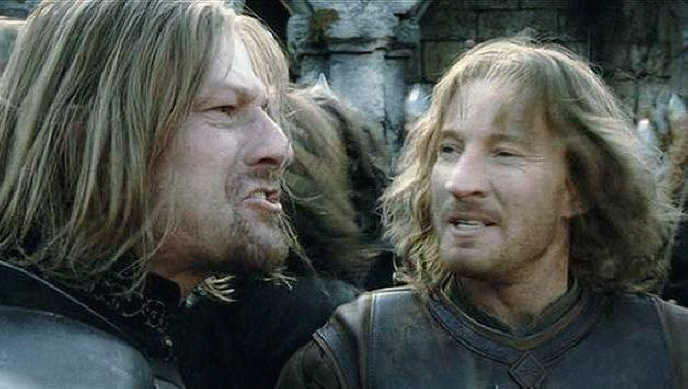 Faramir: Hey brother, I heard some of the soldiers talking � what�s Brylcream? Faramir: I tell you the truth my brother, after this victory we will get a bath and our hair will be clean and that one day you will be proclaimed by the people of Minis Tirith as ruling Steward. had a dream of one who smells fouler and has hair greasier than ours and yet will one day wear the crown of Elendil upon clean hair. Aye, and he will wisely marry into the Elf Clan of the Perpetually Clean Hair, never again go about the kingdom scruffy. Whereas Faramir will marry into the clan of the scruffy (and smelly, no doubt) Horse Lords, so he won�t have to break out the Brylcreem too often.